In Co-operation with EndUserSharePoint.Com , I’d like to announce the first ever SharePoint series of Screencasts in Arabic recorded from Egypt SharePoint User Group meetings and presented by me. Special thanks to Mark Miller ( owner and editor of EUSP ) for being interested in the Arabic content and our activities at Egypt SharePoint User Group. You can find here screencasts, slidedeck and photos from the most recent meeting where I spoke about SharePoint Content Types. 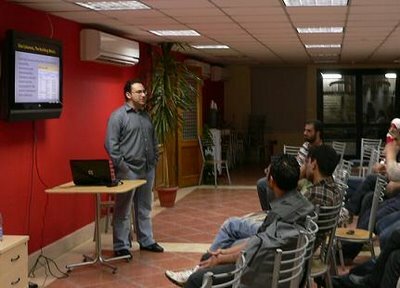 Two weeks ago, Egypt SharePoint User Group second meeting was held, Special thanks for ITWorx for hosting the event. The sessions went really great and we had a great guest: Michael Noel, A SharePoint Guru, speaking about “Building a perfect SharePoint farm”, it was very informative and useful. Thanks Michael and I hope that you enjoyed your time in Cairo and Alexandria. For me, I really had great experience speaking about my favorite topic in SharePoint “Content Types“. Firstly, I spoke about Content Types from the End User perspective, demonstrated Site Content Types and List content types then I switched to the development part where we developed Content Types using CAML and I discussed some methods to design everything from the UI and export the Content Types to Visual Studio and deploying them through “Features”. Finally, I discussed how to customize Content Types forms and how to customize SharePoint through Content Types. The session was very interactive and we had very nice and interesting attendees. Yes, It’s possible to retrieve the LoginName of a user if you only have the DisplayName ( Last Name + First Name ). You can directly query the Active Directory. I prefer the third way, much easier. One of the nice features of SharePoint is “Surveys”. They allow you to create a set of questions and have users of the site fill them in. It allows for selections from a set list, rating scales (where you rate a number of items along a scale from, say, ‘not at all’ to ‘extremely’) and even flow logic (where the outcome of one question causes certain questions to be skipped). For intranet-type team sites, this just works like a charm. For public sites with anonymous access however, it turns out not so easy. To fill out a form, the user must have write access to the surveys library for example. Normally, we of course never allow write access to anonymous users. This article will show you how to configure your survey for use on a public anonymous web site (it involves a little trick). Note that this tutorial applies to ALL flavors of SharePoint, both WSS 3.0 as any of the MOSS 2007 licenses.